ELITE TRAINING CAMP IN LAS PALMAS JAN 20TH -FEB 17TH 2019! Escape the winter darkness and enjoy the sun, warmth and individually adapted elite training at the beautiful Las Canteras in Las Palmas, elected one of the best beaches in Spain. This is an unique opportunity to train as a pro! Rasmus Jonsson, Anders Kristiansson and BeachTravels’ top class instructors are doing all the coaching, and the number of participants is limited. Focus will be on delivering a professional experience with high quality training. Booking will only be available for groups of 4-6 players until September 15th. After that, we will accept individual sign-ups for the Individual Skills Training. If you’re interested in training in Las Palmas, but don’t belong to a group, please contact rasmus@beachtravels.se and we will do our best to help you out. This group is for those of YOU who wants to improve your game and become a better player and are not able to put together an own group. Focus will be on passing, setting and attacking and individually adapted for your needs. It will be high quality training with a lot of repetitions in game like situations to develop your technique and understanding. Focus will be on YOU as an individual player regardless of the other participant’s level and knowledge. This group will have a maximum of 6 players/week. You sign up as a group of four or six players or you can come by yourself and practice with the Individual Skills Training group. Choose the players you want train with, decide which week suits you best and contact Rasmus Jonsson at rasmus@beachtravels.se. You will be staying in an apartment close to the courts, with well equipped kitchen. Nearby you will find shops, supermarkets, restaurants and cafés amongst other things. You book your own flight. From Scandinavia Norwegian is probably the easiest and cheapest. 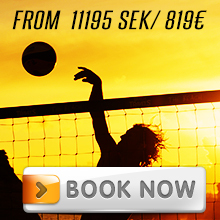 A return ticket costs from 1400-2000 SEK and up, depending on your departure city. Norwegian offers direct flights from Stockholm three times a week, Gothenburg twice a week, Copenhagen five times a week, Malmö once a week, Umeå once a week, Oslo seven times a week and Helsinki three times a week. Check out www.norwegian.com, the destination is Gran Canaria (LPA). Ryanair also flies to Gran Canaria from Stockholm, Västerås, Oslo and Århus. Well-equipped gyms are located at a walking distance from your accommodation. Upon request and additional fee we will provide help with the physical training. Designing, programming and technical execution adapted to the individual.